How many rounds can I now ‘endure’ at kickboxing? Well, last time at class, did 4 sets of 10 minutes EACH! And with just 1 minute rest per round! And with ankle weights pa during the rounds! I know, I know… it’s all I can talk about but then I’m really proud of what I’ve accomplished so far, and seriously, at 3x a week, kickboxing class is taking up so much of my “me” time. While waiting for HP4 to come on at the theater, saw previews of 2 new movies I would love to watch! One is “An Unfinished life” starring Robert Redford and Morgan Freeman. Oh, and Jennifer Lopez is also in the movie. But of course, in a minor role, compared to these 2 acting gods, heavyweights Robert Redford and Morgan Freeman. Just seeing the preview reminded me of another great movie I saw recently on HBO. Movie was “Secondhand lions” starring Robert Duvall, Michael Caine, and Haley Joel Osment. I was able to watch mid- to the last part of the movie, but that was enough for me to want to watch the whole thing so I’ve been trying to find a copy of my own. Either that, or trying to wait for it to be shown again on HBO, and taping it then. As for “An Unfinished Life”, already have plans to watch it with another movie fiend, my friend Mars. Finally saw the HP4 movie! Yup, long overdue. Considering how busy our weekends have been, really couldn’t find the time to go out with the kids. So once we found out that another 3-day weekend was coming, we planned our movie date for this Sunday. The wait for the movie was well worth it. The movie was awesome! The kids were shouting at some parts of the movie, from the excitement, and though there were also some scary parts especially when you-know-who made an appearance, the kids were okay with it. The movie was 3 hours long, but so much fun to watch. Special effects were really good! Patrick was kinda antsy a few times but would later on sit down and watch. Loved the movie immensely, but at 3 hours long, it was still lacking. I would have loved to see how the other 3 champions (Cedric, Fleur and Victor) handled their first challenge with the dragon. And also how Barty got out of Azkaban, how he captured Mad-eye Moody… You get what I mean. Though I read all HP books, would have still wanted to see how it would look on the big screen. But then that’s just me. In our kickboxing class, there are 3 girls. 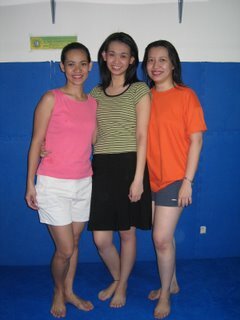 Mhel, Grace and myself. Our class is growing to include more guys who are into MMA (mixed martial arts) and BJJ (brazilian jiu jitsu) who are cross-enrolling, and so, we're greatly outnumbered. There are times (especially during Saturday classes) when I'm the only girl in the gym. And some smart alecks would ask, "hey, sheila, how does it feel being the only girl? Di ka nako-conscious?" Grrrr... as if i need to explain why i'm there in the first place. Anyway, going back to us girls in the class. We've been baptized "Team Marshmallow" but don't let that "girly/sissy" name fool you. We may look soft, but we can endure as much suffering, errr... training, as the boys. As our instructor would himself say, he trains us the same way as he trains the guys. And personally, i'm okay with that. Hey, i specifically remember someone saying before, i'm just 'one of the boys'. Kickboxing ... 10 minute-rounds... Too tired to move, talk or think...'Nuff said! That’s exactly what Carlo said last night, after a particularly trying workout. And why? Because he really pushed us to the limit. Imagine, making us do SEVEN minutes of of jab-straight-roundhouse (left & right) then some more exercises, such as knee ups, front kicks, side kicks, you name it, we did it! Each round was 7 minutes, and we had to do 5 rounds total! Plus, with 3 lbs dumbbells in each hand pa. For a grand total of 35 minutes, AND with just 1 minute rest after each round! Whew! It seemed we hadn’t caught our breath yet, when we were at it again! Carlo didn’t tell us at first how much work we’d done. He had a naughty twinkle in his eye when he said above our weak protests, “Stop complaining. You’ll be proud of yourselves. You’ll later find out why”. And that was it! WE all didn’t realize that we were doing 7 minutes! Gosh! 1. Consult your doctor before starting the diet. 2. Do not skip meals. 3. Drink four to eight 8 oz. glasses of water daily. 4. Do not add fats when preparing food. Important: do not vary any of the above foods. And yes, low-fat vanilla ice cream is an important part of each day on this diet! I woke up pretty early today (considering it’s a holiday). Hooray to 3-day weekends!!! Got a chance to do some gardening. Well, if you can call dumping coffee grounds into the pots, gardening. Heheheh… It’s been a while since I’ve actually tended to our plants and was so pissed to find out that the 2 basil plants Ellen gave me already dried up. So okay, I may not have a green thumb, but I still dream of being able to grow different kinds of plants, but more so, herbs and vegetables. Anyway, I got the coffee grounds from the Starbucks outlet in our building, which was giving it away. Actually, in all Starbucks outlets they give away the used coffee grounds for free, packed in a strong, big, aluminum bag, and you can use this as fertilizer for your plants. How do you get the grounds? You just have to ask for it. Usually, it’s just on the floor in front of the counters at Starbucks. Read the flyers at Starbucks about this before but this is the first time that I actually asked for them. Dunno if they’ll work but then it won’t hurt to try. Take note, MEDIUM. You may think, “so what?”. But hullo… a few months back (late March or so), I bought a new swimsuit in LARGE. So buying the swimsuits and FITTING into it are 2 totally different things! But I figured if the suits didn’t fit, I could give them away. Christmas is just around the corner anyway. So anyway, I tried on the swimsuits at home. And they fit! And no, I don’t look like a ‘suman’, bulging in all the wrong places. Nyehehehehe… And all I can think of now? Ang tagal ng summer! … WOOHOOHOO! It’s back to work so had to wake up early again. Back to life at the office. But honestly, I was beginning to miss the office! Believe it or not, it’s true! Though I enjoyed my long vacation IMMENSELY (starting with that Friday shopping expedition with Ben)! But oooohhh…my aching legs… It’s all those squats we had to do yesterday! Whoa, I’m getting ahead of myself. For starters, we did 10 minutes of jogging around the gym for our cardio. Jogging with punches! Seemed easy enough at first, but I was panting before we reached the 10-minute mark. Then came the squats, 5 sets of 15 reps of squats, while holding a 3 kg medicine ball. Yup, weights! I think we started using weights around 2 weeks ago. From holding on to dumbbells while doing our jab-straights, to holding a medicine ball while doing crunches. Then we next heard Carlo’s infamous line, “Get your wall”. Which means either doing splits, side splits or the killer combo of jab-straight-right knee up-left knee up, for 5 minutes! After the whole day of cleaning my room yesterday, am taking it easy today. Got up 9:30 a.m., had breakfast, and now lying in bed, reading a mag. Sweet! :) Everything is going in slow motion today. Ah, this life I really can get used to. But wait! I have kickboxing later! “Holiday?!? What holiday?! There is no holiday at the dojo.” My instructor’s words ring in my ears. Oh gosh, oh gosh, oh gosh… Gotta get my things ready. Don’t wanna be late.